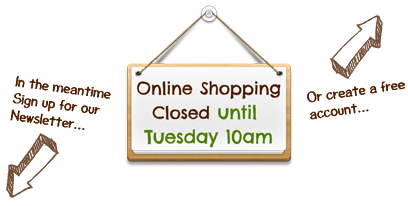 Our online store is open every week from Tuesday 10am - Sunday 6pm. During this time you'll be able to browse our goodies and place your orders, which will then be delivered the NEXT week..
Online ordering can get a little tricky at times! So we’ve broken it down; just follow the numbers from 1 – 5 and before you know it, you’ll soon be the master of your Online Shopping Experience! We currently offer 3 payment options: EFT, SnapScan and Zapper - payment info will be available once you have completed the Checkout Process and you will also receive a copy of your order via email. Deliveries take place every THURSDAY. During the Checkout process one of the steps will be to either select Home / Work Delivery or Store Collection. There is no delivery fee when collecting from one of our stores. If you'd prefer a Home or Work Delivery, we charge R45.00 per order. If your order is R650.00 or more, delivery will be free. If you live outside of Cape Town - please contact us for a quote before placing an order. We currently offer Home and Work Deliveries at a flat rate of R35.00 per order and no delivery charge if the order is R650.00 or more. We have had a large number of requests from you, our customers, wanting to combine orders and have them delivered to a single destination like perhaps an aunts' house or work place. We are now offering a Group Ordering system that allows you to combine your own and multiple peoples order totals; then have the orders delivered to a single address and save on the delivery cost. An example scenario: Your order comes up to R350.00 Your sister also places an order and her total is R400.00 - the combined total comes to R750.00 which qualifies for free delivery! Here is another Scenario: Your order comes up to R250.00 Your sister's order is R300.00 - The combined total is under R650.00, which means either you or your sister need to cover the R35.00 delivery fee. The group ordering only applies when everyone is having their goods delivered to a single address in the same week. 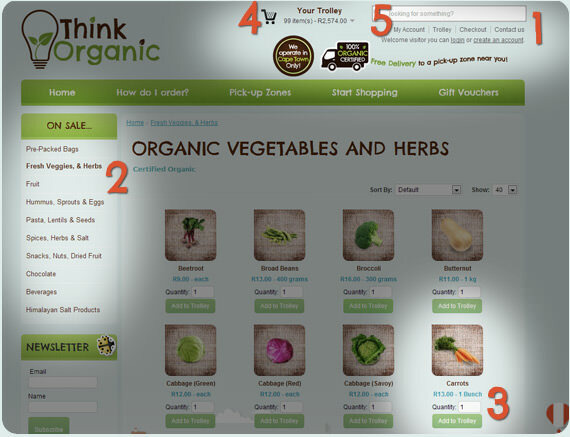 This is a good opportunity to share your 'Think Organic Experience' and encourage the people around you to eat better. If you are interested in starting an 'Ordering Club' in your family or work place, let us know.. free delivery awaits! If you forget your PASSWORD, hit Login at the top right corner of the page and click Forgotten Password on the page that appears! View our Terms & Conditions too. By accepting these terms and conditions, you indicate that you have read and understood them and that you agree to abide by them. That’s pretty much it…if anything is unclear, or you have any questions, send us a message. After all, we’re here to help!